A week of solitude on the Middle Fork River with John Moore and his grandson Charlie, and Michael Diciano, Jim Walt, Kaylen Walt, Lynn Fuller, Bruce Osterlye, and Richard Voss. We lifted off Lake Aleknagik under fair skies and warm temperatures. At Kukaktlim Lake, where we began the float trip, we were met by a Brown Bear sporting a full blond coat. She allowed us all a proper viewing at a respectful distance thanks to Lynn Fullers’ binoculars. A few mature bald eagles graced us with their presence while we inflated the rafts, loaded our gear and made our way downstream under seasonally low water conditions. Guests and guides worked together navigating shoals and gravel bars down through the first few miles until the channel deepened. Everyone participated by hopping out and helping to drag the rafts. 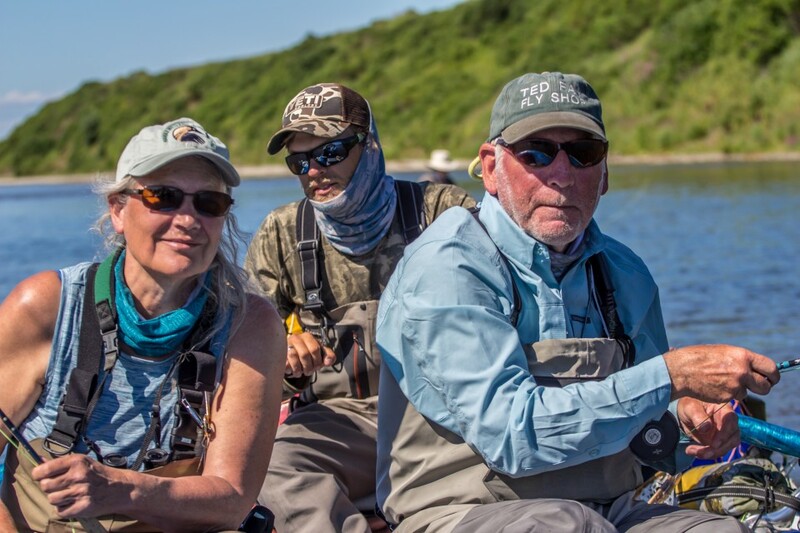 John Moore, who has many Alaska fishing trips under his belt and his grandson Charlie were in Brian’s lead boat, when John spotted an amazing fish. 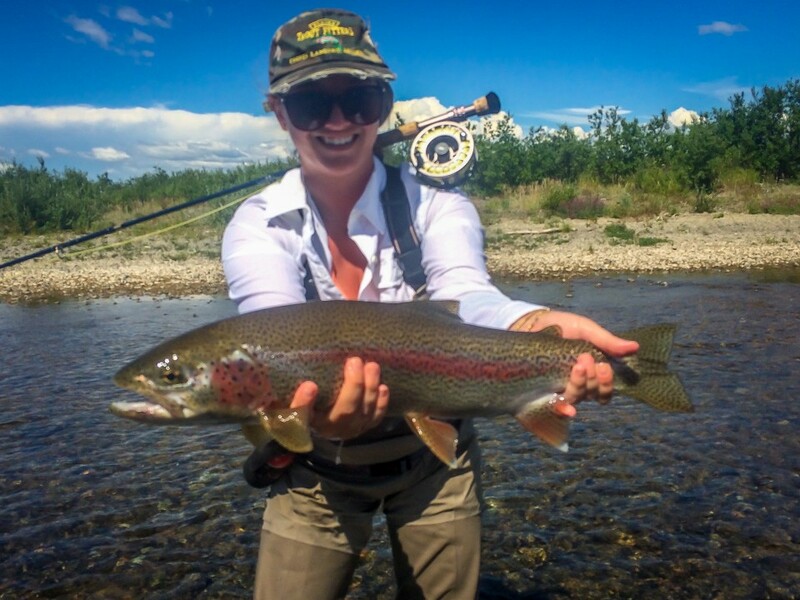 A trophy Rainbow trout was holding in just 6 inches of gin clear water. John presented his leach pattern and the trout turned and crushed it. 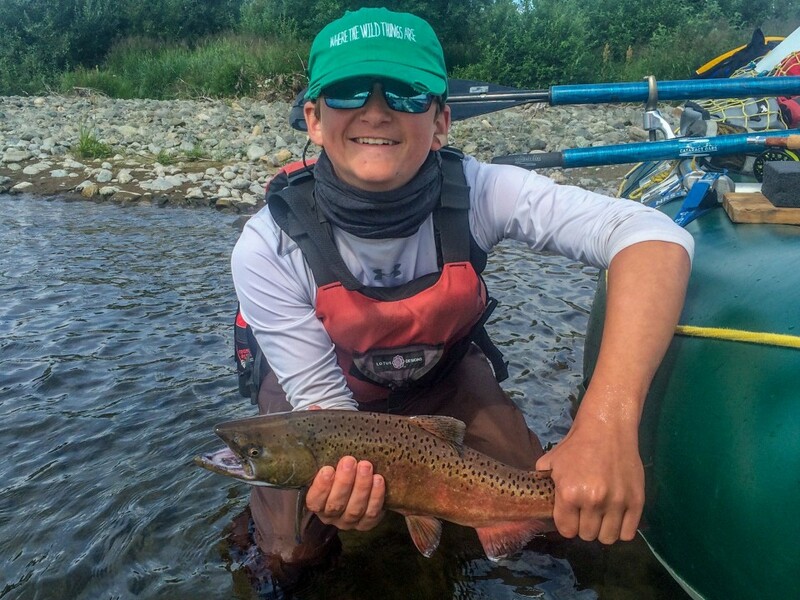 John set the hook, handed the rod to 12-year-old Charlie, and the fight was on. The battle was coming to an end as I rounded the corner to see Brian sliding the head of a 25” leopard rainbow into the net! It was a spectacular fish that was well fought by the young angler. 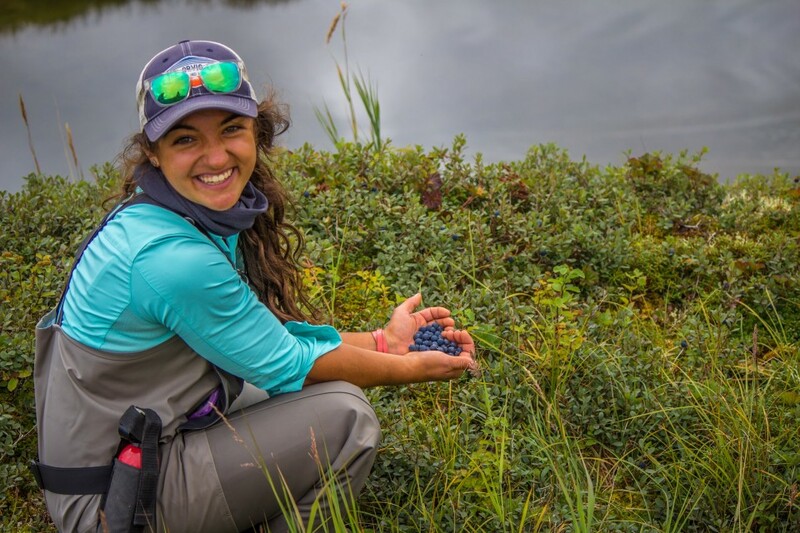 We floated down picking through the shallow water and finding deeper pools that were teaming with bright sockeye. As we came through the pools, the energetic fish exploded around us in their attempts to continue up river. It was far better than any aquarium we had ever experienced. Jim Walt cast mouse patterns and released several Grayling before we made our first camp. Then after we had our fill of a large pasta dinner and enjoyed a cup of wine, Mike Diciano provided camp entertainment and casting demonstrations while fishing late into the evening. 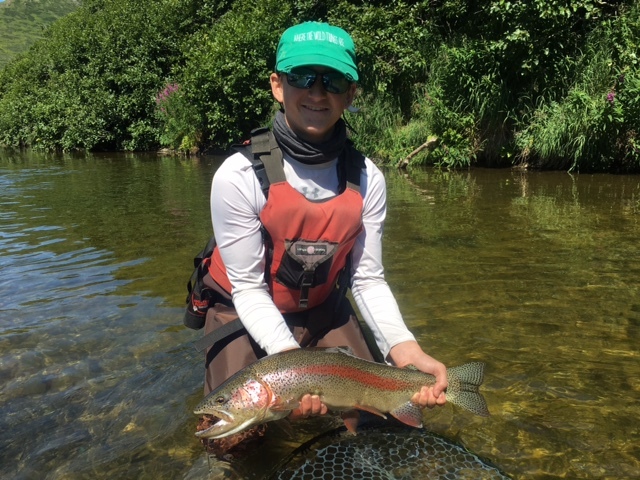 Young Charlie took up the challenge of learning how to fish a trout bead effectively and several rainbows and grayling were taken. Then we all turned in to our tents under the midnight sun. Day two started off strong with all the anglers fishing with great intensity and eager to see how the fishery would change as we travelled downriver by raft. John and Charlie Moore both took several sizeable Rainbow trout on Streamers and Beads. 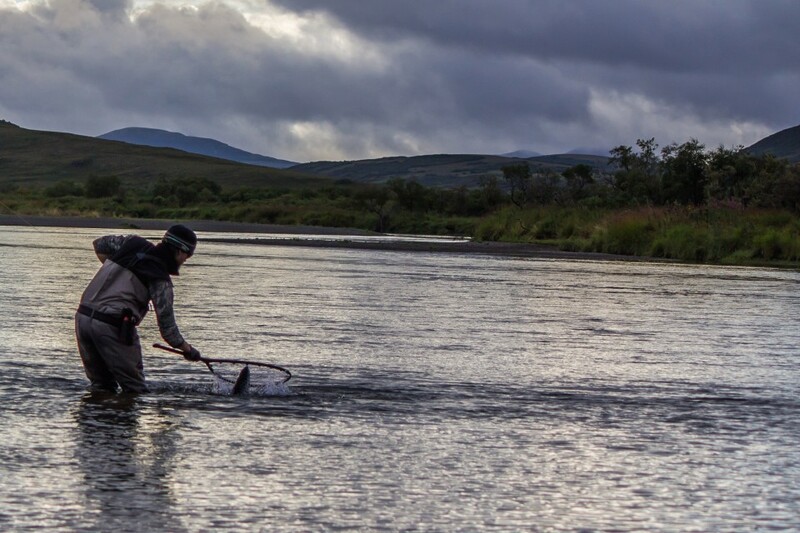 Our 4 rafts worked down through the meanders with anglers casting streamers, mice, and egg imitations past the sunken root wads that give the intimate Middle Fork its character. The root wads, overhanging willows, and narrow channels are a challenge to raft navigation while providing a huge benefit to all the fish that seek cover and refuge in the woody debris. Grayling, Dolly Varden Char and Rainbow Trout were caught in increasing numbers keeping everyone engaged. Late in the day, not far from what would be our second camp, Charlie caught the first King Salmon of the trip. And that got everybody excited! 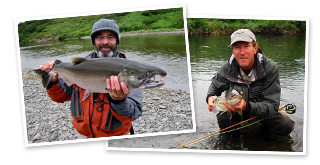 By the 3rd day everyone had settled in to the migratory Dolly Varden Char fishing and mastered how to effectively dead drift a trout bead. Lynn Fuller started off very strong and she and Richard Voss landed more Char than JJ could keep track of in his raft. Everyone was working together in 2 angler/ per raft teams helping one another net fish. The average size of the Dolly Varden Char in the middle fork would turn out to be notably larger then any other river we fished in 2016. 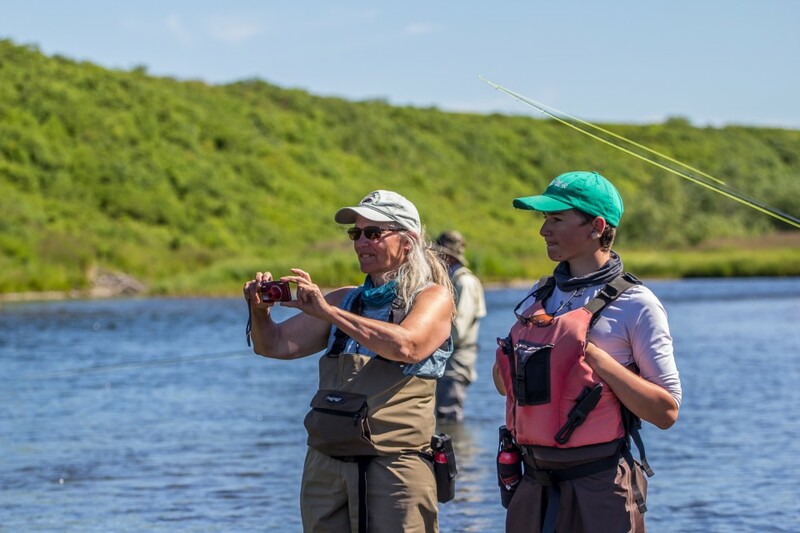 We fished slowly and thoroughly in the morning releasing a couple dozen Rainbows and in excess of one hundred Char plus a smattering of Arctic Grayling, and King Salmon. The day after day of solar radiation (nearly 24 hours of daylight) was taking a toll on the anglers and we all pitched in each afternoon to erect a sun shelter aka “Wing” as soon as we got into camp. Then we enjoyed a reboot of electrolytes in the form of tang and Gatorade. A beer tasted particularly good after a long day on the river. Several of us swam in the river to cool off. It was Pizza night and Pete’s riverside pizza was perfect. 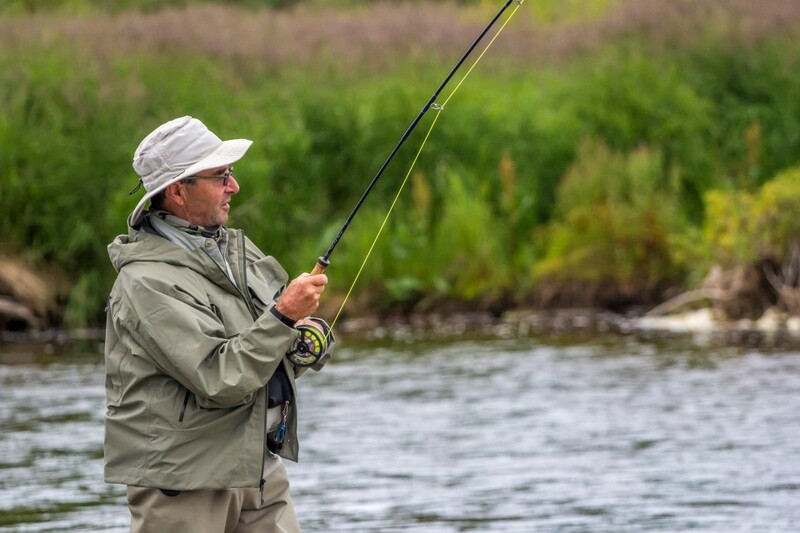 Later Mike Diciano brought out his switch rod to demonstrate a different way to fly fish and provide some fine entertainment. From the log “most of us called it an early night”. Another a great day! We awoke to another morning of blazing sun, a rarity this close to the Bering Sea. With each mile the river grew in volume, the pools deepened, and the salmon holding water increased exponentially. 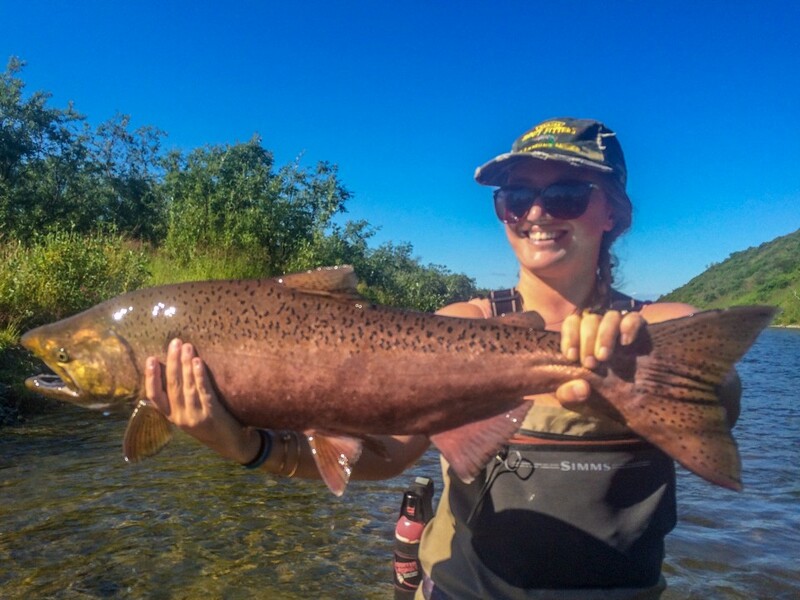 Kaylen Walt capitalized on these opportunities and released a fine king salmon taken on a bead! Just before lunch the rafts convened along on a deep stretch of water where Chum, Pink, Sockeye, and King Salmon were staged. That was a fine sight! Salmon all stacked up. Michael Diciano took an acrobatic Sockeye that provided a brilliant aerial display, and later on, was our dinner. 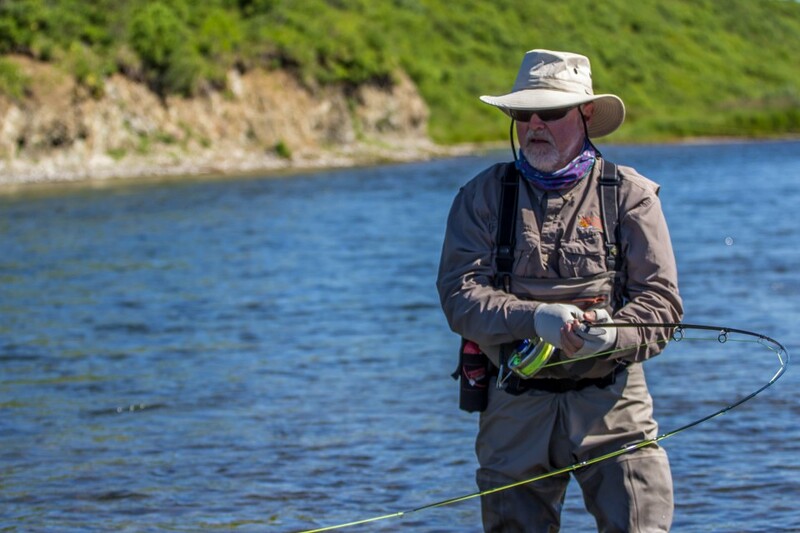 Jim Walt tied into his first king salmon that severely tested the limits of his 8-weight rod. Kaylen followed up her father’s fish with a big 15 Lb slab of a Chum salmon. The log records that “ Numbers of Char taken started to drop off by lunch and most of the anglers switched to casting streamers to Salmon. Lynn Fuller caught her first Pink Salmon on a fly at lunch. Kaylen released two King Salmon at lunch and Michael roped a Chinook of his own. Pink and Chartreuse streamers were the hot tickets for King Salmon. 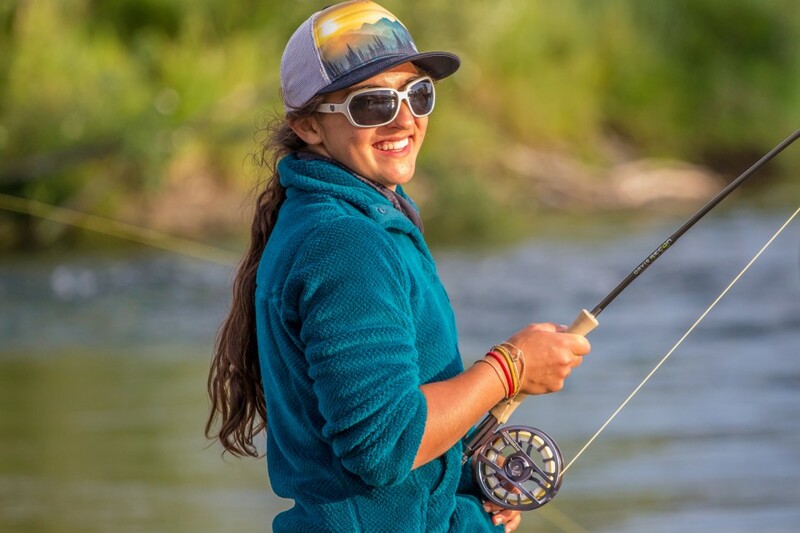 We headed down stream and Kaylen Walt spent the rest of the afternoon relentlessly pounding the bank with a mouse pattern, which yielded a fine trophy Rainbow. The log records 13 Kings released this day. 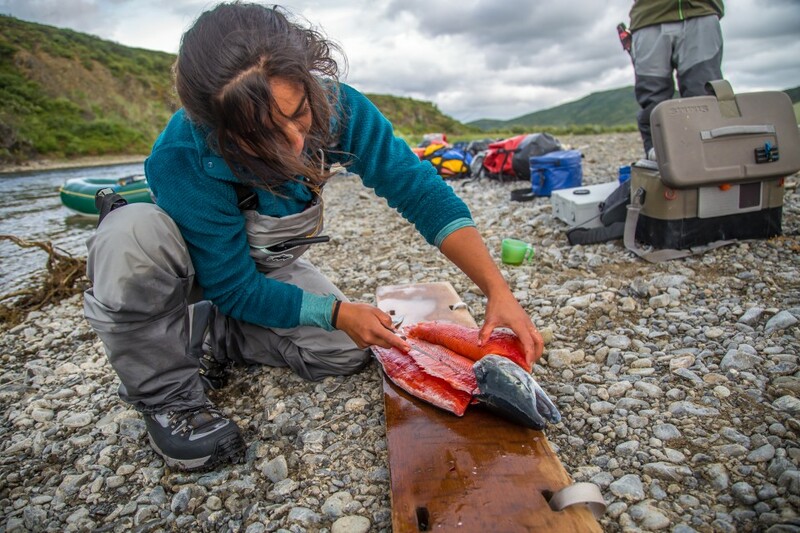 At camp Aubrey proved that she is the most skilled individual any of us had seen with a fillet knife preparing the sockeye that Michael had landed earlier. She filleted with a methodical, meticulous method that attracted a crowd. An amazing Sushi dinner followed and then we viewed the sun setting behind a single large cloud to end the day. “The steep alpine headwaters gradient down which we had rafted was now gone and we were out of the mountains starting to enter the coastal plain”. The Middle Fork by now had picked up tributaries, widening, slowing, and meandering. 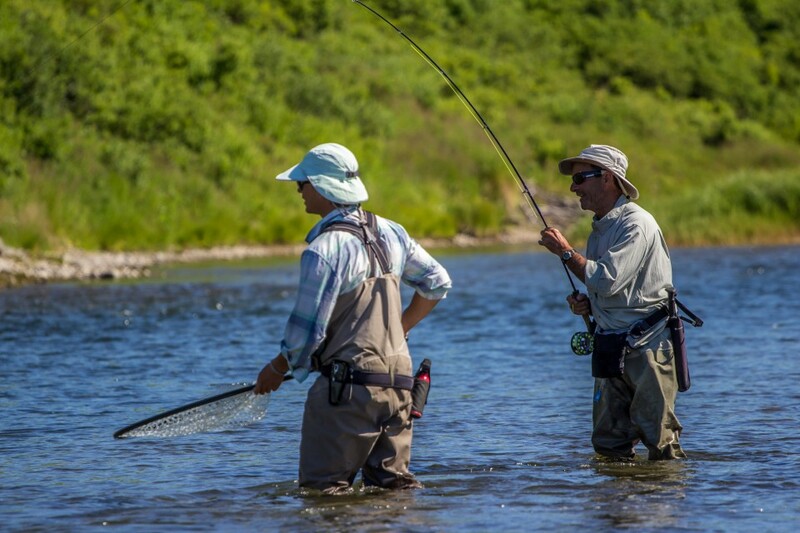 It remained a relatively intimate and peaceful river, but the fishing became more challenging. We found King Salmon mixed with Pink Salmon right out of the gates in the morning. Several Kings where hooked but they were difficult to bring to hand. Bruce Osterlye landed a couple of large bright Pinks as we descended toward the estuary. John Moore was rewarded for the long hours casting a Kilowatt pattern streamer and released another trophy rainbow. As we approached the weir, we noticed the numbers of Sockeye dramatically increased. It was getting late in the day and we were still looking for a dinner fish. We noticed one of the biologists filleting a fresh sockeye for their own dinner, which was as a subtle reminder for us to “get on our game”. The weir, staffed with fishery biologists, is a fish counting station (with a regulation that we cannot fish within a 300yds of the weir) but we had another form of entertainment there while our fly rods were stowed. The weir dog, a black lab, was quite the swimmer. Her owner would toss a metal filled piece of PVC pipe into the water and she would bound down the bank and dive down 12’ to retrieve it. Kaylen Walt got a phenomenal underwater video of the diving dog in action. Richard Voss released a nice bright king about ½ mile below the weir and the hunt for a dinner fish continued since that was too large for our group to consume. The lower river was chock full of Rainbows and everyone fishing a streamer caught a good number of these 12-14” cookie cutters. 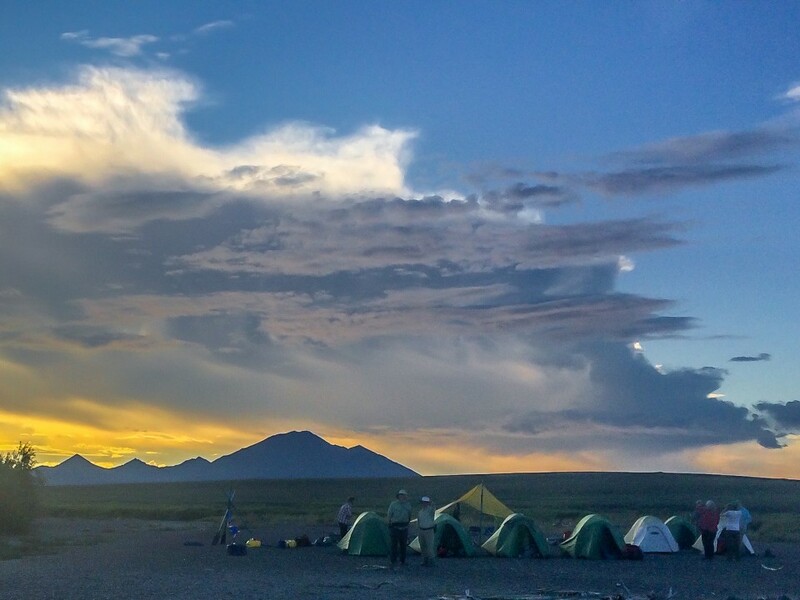 We made camp and continued to hunt for dinner as the guides set up. 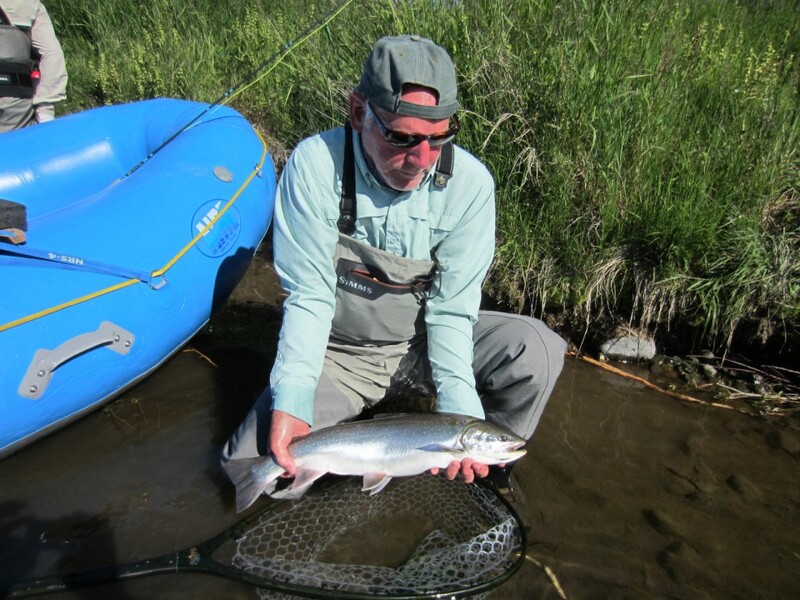 Anglers released several bright Chum and Pinks that put up a great fight but were not the Sockeye or bright Dolly Varden Char the chef was hoping for. However in consultation with our guest Bruce Osterlye who is a talented Chef in his own right Pete made the executive decision to keep a bright Pink salmon. Aubrey filleted it masterfully then Chef Pete worked it into his signature salmon curry. Alerted by the enticing smells, a young Red Fox wondered into camp to sniff around a bit. 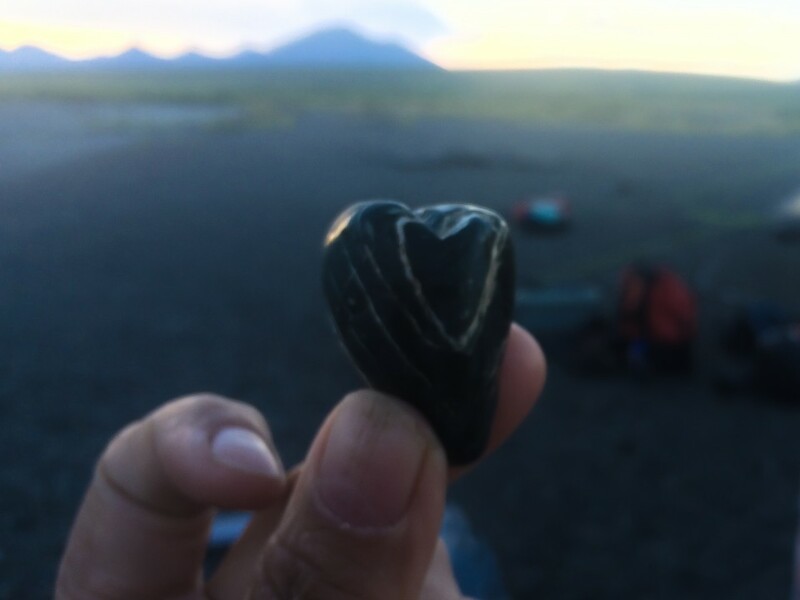 From the log of our final evening, “Richard managed to rope into something more ferocious then the fresh Chum and Pink Salmon we had been catching all day. This fish pushed the limits of his 8wt and he had to give chase down river. The fish when brought to hand, was a beautiful, bright 20lb King Salmon. A fine fish to bookend the trip on! The Row to take out was peaceful in the early morning hours. We finally left the mountains behind us and reflected silently on the week we had just been through. It was one of the hottest weeks of the summer and in untraditional fashion, we hardly used our raincoats the entire time. It was a beautiful experience that we all felt went by too quick. However there’s always next year.